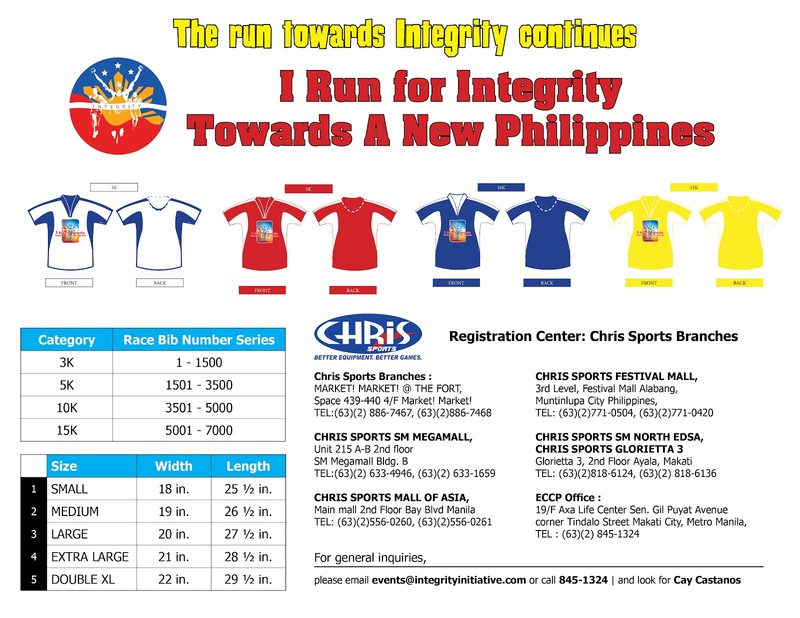 The Integrity Initiative invites everyone to participate in the “I Run for Integrity towards a new Philippines” with 3K, 5K, 10K, and 15K runs. 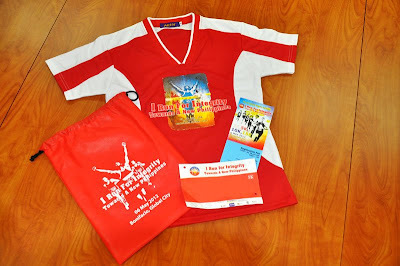 This will be held at Bonifacio Global City on May 6, 2012. The ”I Run for Integrity” is a symbolic run and a bold move by the private sector as a CALL FOR THE WHOLE NATION to join the RUN towards a New Philippines – A country that will be known for its Integrity. More than 5,000 runners joined the 2011 event. This year, our target is to have at least 7,000 runners to participate from all sectors of the society - private sector, government, judiciary, academe/youth, civil society, church, media and all Filipinos who care enough to effect a culture change in winning the fight against corruption in the Philippines. This run has been sanctioned and certified by the Philippine Amateur Tack and Field Association (PATAFA) and will be carried out in accordance with the regulations and sanction of the I.A.A.F. Assembly – 4:30 a.m at 9th Ave. cor. 28th St., Bonifacio Global City. CLOTHING CHECK-IN SERVICE – Located on Katipunan Circle between 8th and 9th Ave.. Only clothing will be accepted for check-in. No bottles, coolers or other items. We assume no responsibility for items checked-in. AID STATIONS – Water is available at the start and at every 1.5 kilometers then. There will be aid stations and medical assistance will be available. Please drop drinking bottles or cups at or near the stations. WARNING: Inadequate training, failure to pace and disregard for the importance of taking fluids has resulted in life-threatening conditions such as heat stroke in both experienced and first time marathon entrants. If this is your first marathon or first experience in a warm, humid climate, take fluids at each of our aid stations. Should you begin to experience difficulties, stop and ask for assistance from the medical personnel at the aid station before continuing. The finish line and all support services will officially close at 10:00 a.m. It includes the following: Race Packet, Singlet, Race Bib, Post-event Pack, Finisher Certificate, and Medal for all 15K Finishers. Assembly location: 9th Ave. cor. 28th Street, Bonifacio Global City, Taguig, Philippines. 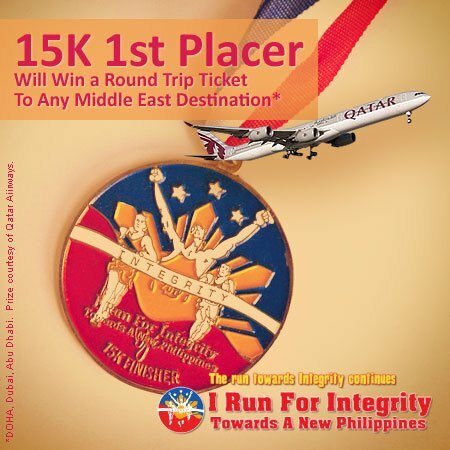 The 1st placer of the 15K run in the upcoming "I Run For Integrity Towards A New Philippines" this 6th of May 2012 will win a Round Trip Ticket to any Middle East destination (DOHA, Dubai, Abu Dhabi) courtesy of Qatar Airways through QMILES (frequent flyer miles). The prize can be immediately used as a ticket and is valid for five (5) years. Please know that the registration for the run is still open until the 3rd of May (Thursday) in most Chris Sports branches and on the 5th of May (Saturday) at the ECCP Main Office (19th Flr., Philippine AXA Life Centre Bldg., Sen. Gil Puyat Ave. corner Tindalo St., Makati) from 8AM to 5PM as well as at the BGC Activity Area (9th Avenue corner 28th St., Bonifacio Global City, Taguig) from 7PM onwards.